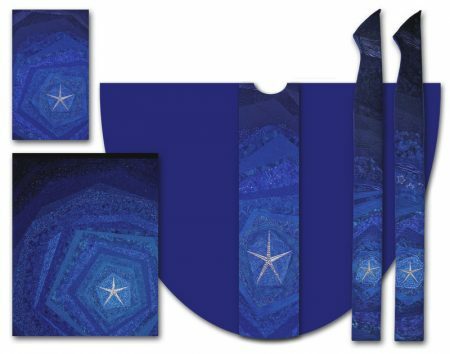 Inspired by these words in John 1, this design interprets two parallel movements inherent in the Advent season – order emerging out of chaos and light piercing the darkness. Together, these movements affirm an important thematic emphasis that has fallen into disuse in recent decades: the emphasis on Christ’s coming as a “judgment” that shatters all of our illusions about who we are. Because this shattering of illusions is what prepares our hearts to receive the gift of Emmanuel, the liturgical season of Advent becomes a reminder that even the judgments of God are purposed in grace-full outcome. This work was constructed from commercial cotton, satin, and metallic fabrics, then embellished with improvisational machine stitching.